Somewhere in this country there is a woman in a waiting room ready to be called back for her appointment. The flatscreen TV in the room is showing HGTV’s Fixer Upper series and the Gaines’s are walking through plans for their new project. The woman turns to the stranger sitting next to her and says “Oh I love this show” and the two begin a ten minute conversation about which Fixer Upper projects were their favorites. Joanna Gaines has captivated many with her fresh take on timeless design – with a sprinkling of modern elements, unique pieces with character, and sentimentality. Perhaps it’s no wonder Joanna’s Instagram post last year announcing her newest Magnolia Home Furniture collection for High Point Market had well over a quarter of a million likes. People want to “Fixer Upper” their homes with timeless furniture and décor and modern farmhouse details – and Joanna is showing them how. But we wanted to know how people are shopping for furniture. 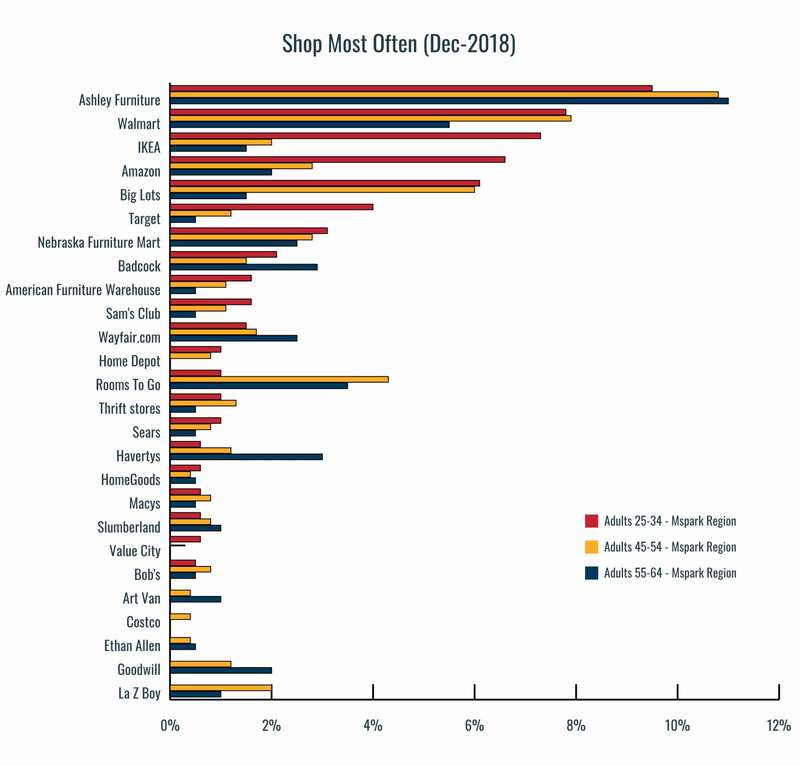 What stores are popular, what formats are popular, and what really drives store loyalty? We found 3 charts that break it all down by generation in our Mspark geography – read on to find out how. In this first chart, we clearly see just how different age groups are in their store preferences. Millennials are far more likely to shop often at IKEA than their Boomer parents. It’s possible this IKEA loyalty has a lot to do with the popularity of “IKEA hacks” found online where people share how they used their DIY skills to transform a $30 IKEA drawer chest into a what looks like a high-end piece of furniture – “fixer upper” indeed. IKEA’s environmentally concious brand likely resonates with Millennials as well. And of course we have a strong contrast between Millennials and older generations when it comes to purchasing furniture online from Amazon. 100+ year old long-established brands Boomers have grown to love over the years, such as Haverty’s and Badcock are still favorites with older generations who appreciate the timeless collections they can find at both stores. 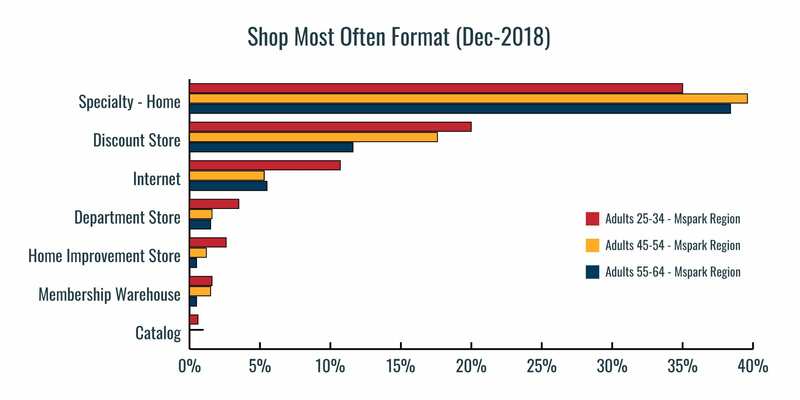 When it comes to store format, we see Millennials having more of a tendancy to grab whatever they want wherever they can find it. We even see them catalog shopping, although not very much. For furniture stores, this might be good to know because what it says is that Millennials are likely looking for individual pieces that speak to them. So they may walk in your store looking for a bed that will look great next to nightstands they found at Target that look amazing paired with a dresser they bought off Amazon. When advertising to these kinds of shoppers, it would be a great idea to present individual pieces that easily mix and match well with certain popular styles of furniture. 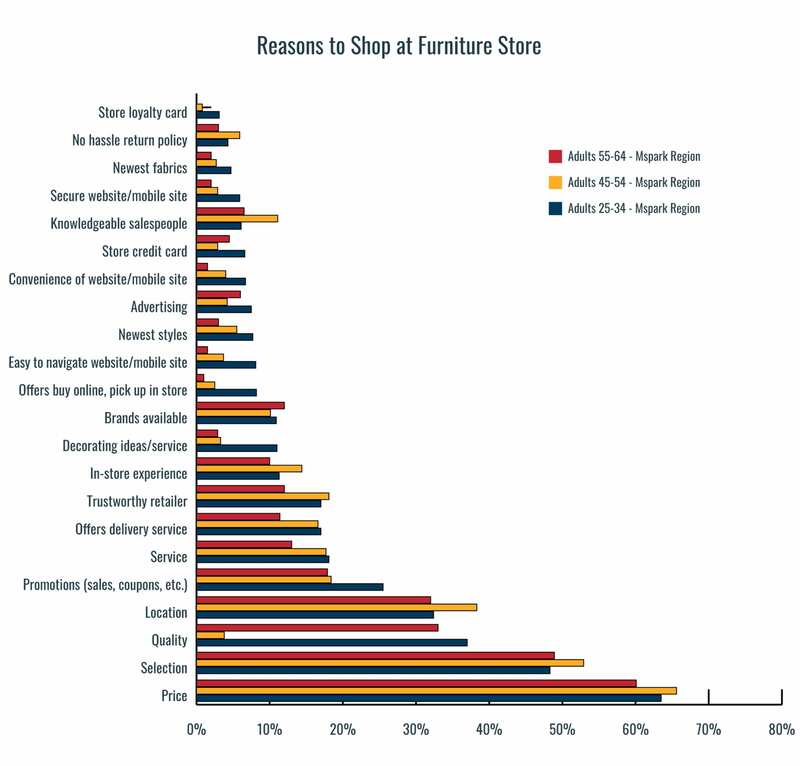 In the below chart, we see reasons why certain age groups shop most often at a certain store for furniture. Here Generation X is all about service and convenience. 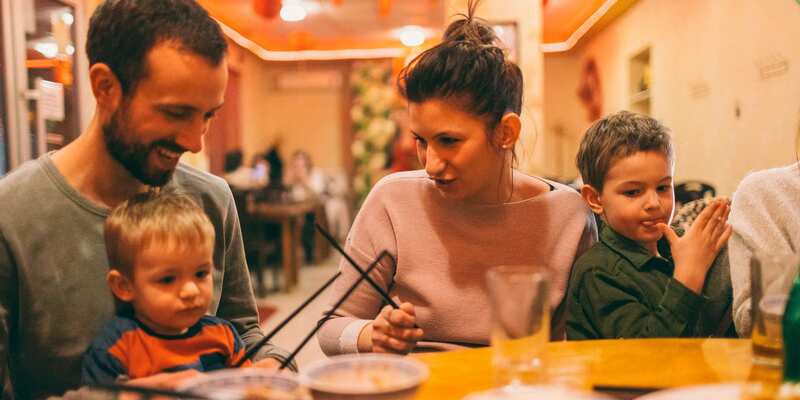 They like shopping at a store that’s in a convenient location, has a great selection so they get what they need and be done, and has great salespeople who can help them make a decision so that can get what they need and go. Remember, Generation X are the no-nonsense, often blunt, no frills kind of people that prefer a shopping experience with very little friction points. No hassle return policy – they are the ones that value it the most. Millennials want sales, coupons, and promotions. They like great advertising. 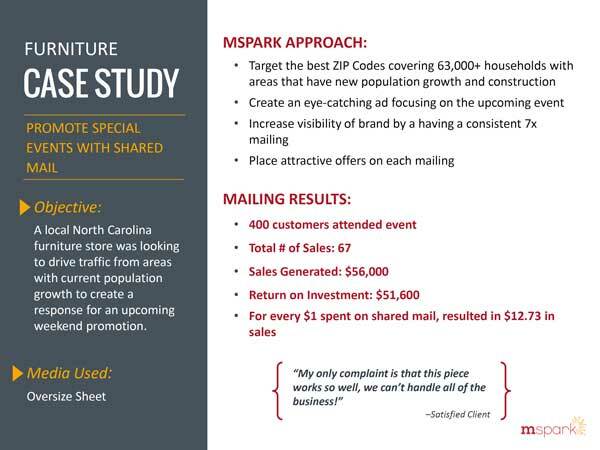 If you’re doing direct mail campaigns, they’re noticing. When they walk in a furniture store, they are going to expect someone who can help them with their décor ideas. They may even share their Pinterest Board or favorite Instagram accounts. They want a great online experience as well as the option to buy online and pick up locally. Delivery service is a plus. With so much inspiration, from Joanna Gaines, to IKEA hacks, and the constant stream of #farmhousedecor on Instagram with 1.4 million posts, we are certainly in a “fixer upper” golden age. Furniture retailers are in a unique position to get in on the fun and transform homes everywhere into cozy sanctuaries fit to grace the pages of House Beautiful and Traditional Home. 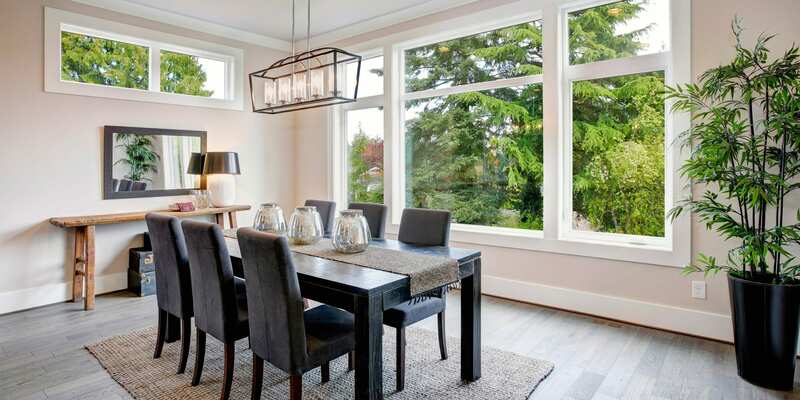 Knowing your ideal customer and how they are different is key to crafting the perfect message that assures them the eye-catching pieces they need to finish off a room are waiting for them just around the corner. 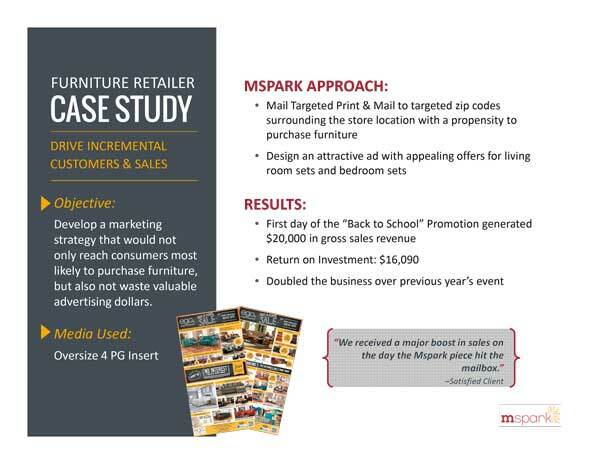 Direct mail is a great way of getting your messaging out to these customers as it has the highest response rates. In fact, according to recent numbers from ANA/DMA, direct mail response rates are at 9% for house lists and 5% for prospect lists. 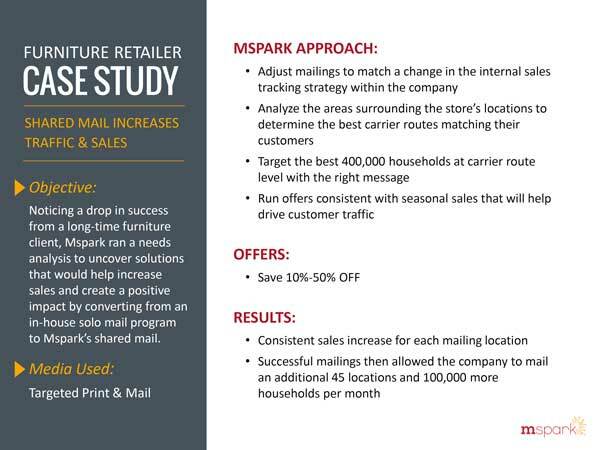 If you’re considering direct mail marketing and need some inspiration, check out our success stories below. If you’re interested in learning more about identifying and attracting the right customer to your store, give us a call today. 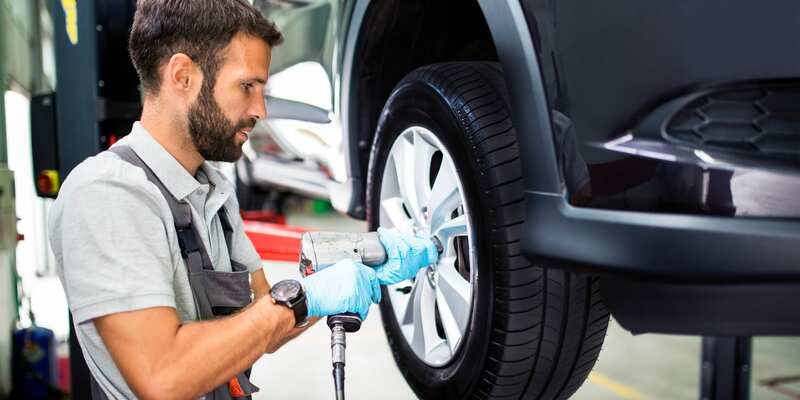 How Can Hardware Stores Attract Customers and Grow Revenue?